About the board: The Shubu Kraken is the inflatable version of the Supconnect award-winning Boardworks Kraken. This one is on the top of the charts when it comes to inflatable paddle boards. As far as graphics go it’s just gorgeous. It's a very lightweight board weighing in at about 20lbs making it incredibly easy to carry for both men and women. At a price point under $1,000 you couldn’t go wrong with this board. It’s super fun to paddle, has a great glide, and is really stable without compromising the glide feeling. One of the best inflatables that we’ve paddled all year so definitely check this one out. Read more HERE. About the board:If you’re looking for a board that you can do long distance paddling whether it is for race or touring, the Great Bear is a great option. It has lots of bungee cords up on the nose and tail with some really good looking graphics. The board has a beautiful layout of wood on the top of the deck, and the traction pad and graphics of the board work together beautifully overall. The board comes with the LiftSUP handle making it very easy to carry. The Great Bear glides incredibly well, ideally being used in a long distance race and also for expeditions. So for those looking to go that extra mile you should take a close look at this board. Definitely an A grade. Read more HERE. Weight: 21.2 lbs Sizes: 10'6"
About the board: The Boardworks Shubu Riptide is a solid option for beginner paddlers looking for an affordable, easy-to-carry, inflatable board to paddle short to mid distances. At just $599, the Riptide is a great all-around and stable board for beginners and paddlers that want a simple, lightweight board for occasional use. A great entry level inflatable board. Read more HERE. Weight: 22.3 lbs Sizes: 10'6"
About the board: If you’re looking for an affordable, inflatable paddle board that is designed for beginners then check out the Shubu Solr from Boardworks. Lightweight, affordable and fun the Shubu Solr is a super stable board that’s designed for all around paddling and works best paddling in short distances, usually around the beach or dock. At $749 the board sits in the popular mid-tier market in terms of affordability. Read more HERE. Weight: 29.04 lbs Sizes: 12'6"
About the board: If you’re an intermediate paddler looking for a quality non-inflatable touring paddle board then check out the Boardworks Chinook. The Chinook is a fairly stable board meant for intermediate paddlers who are looking to paddle mid to long range distances up to 10 miles or more. The Chinook is also a board that’s solid and durable but it is somewhat difficult to carry. The board however is pretty affordable and sits at the higher end of the the popular mid-tier market. Read more HERE. Weight: 26.7 lbs Sizes: 9'6", 10'6"
About the board: The Shubu is a very stable, inflatable board that is great for beginners. The board takes the simple route in terms of looks, coming with a limited play on color and graphics however, it offers unique features having two side-bite fins and with the option of adding a third, FCS II center fin into the center fin box which is unusual for inflatables. It has reinforced rails and an arch bar in the center to help with rigidity and comes in a nice portable bag and has a repair kit in case of damage. The board has premium qualities for an affordable price, meriting it Supconnect’s “A” grade. Read more HERE. Weight: 27.3 lbs Sizes: 10'6"
About the board: The Muse is a very stable, non-inflatable beginner board designed for all-around paddling. The Muse is an award-winning board and has gorgeous graphics geared in particular towards the female paddler coming with an exceptional mix of bright colors and artwork that are eye-catching and nice to look at. 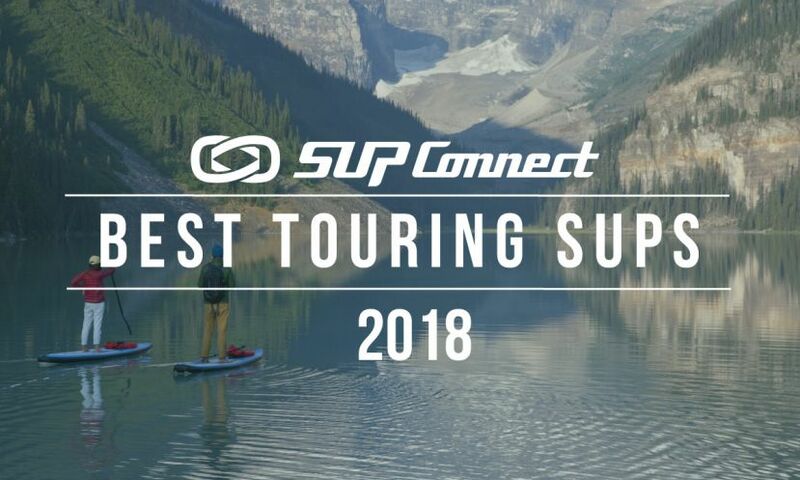 The board misses a few points like lightweight construction and speed-centric design that many intermediate and advanced paddle boards encompass but for the affordable price the Muse is a stunning all-around board that is great for recreational paddling, well-deserving of Supconnect’s “A” grade. Read more HERE. Weight: 28.01 lbs Sizes: 9'11"
About the board: The Joyride Flow is a great non-inflatable all-around / yoga hybrid board suitable for paddlers with any skillset. The board is very stable due to its width of 33 inches and the graphics are gorgeous, featuring a wood deck and awesome artwork on the deckpad. The deck pad conveniently doubles as a yoga mat for times when you want to practice your yoga on the water and has bungee tie downs that are perfect for holding gear while you’re on the move. This paddle board is easy to carry due in part to the LiftSUP handle as the main holding point in the board. Because of the multi-purpose aspects of the board in part with premium features like the LiftSUP handle the Joyride Flow is awarded Supconnect’s “A” grade. Read more HERE. Weight: 25.5 lbs Sizes: 10'6"
Who is this for: If you’re looking for an affordable, all-around, inflatable board that is very stable to paddle then Boardworks’ Shubu Sport is worth a look. This stand up paddle (SUP) board comes in the single chamber drop stitch technology which is meant to be durable. The board is very stable due to its 32 inch width and the board has 2.43 lbs per foot weighing a total of 25.5 lbs. Its shape makes the Shubu Sport an all-around board suited for paddlers of any skill level. Its construction and shape combined best fit this board for short-distance paddling, mainly around the beach and dock. Retailing at $899, the board sits in the lower-end of the popular mid-tier market in terms of affordability. Who is this for: If you’re looking for a very stable, non-inflatable, all-around board to paddle mid-range distances then the Boardworks Kraken is worth a look. This stand up paddle (SUP) board comes in the EPX-Veneer construction which is durable having both positives and negatives. Due to it’s 33 inches in width the board is very stable. Its construction is moderately heavy coming in at 3.32 lbs per foot weighing 34.08 lbs. Its shape makes the Kraken an all-around board that can be used by all skill levels and is primarily designed for recreational paddling and/or paddle surfing. Its construction and shape combined best fit this board for mid-range distance paddling between 3 - 5 miles max. Retailing at $1,299 the board is in the popular mid-tier market in terms of affordability.